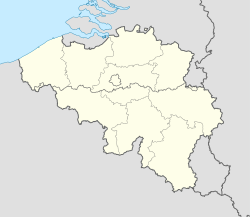 Jodoigne (French pronunciation: ​[ʒɔdɔɲ], Dutch: Geldenaken [ˈɣɛldəˌnaːkə(n)]) is a Walloon city and municipality located in the Belgian province of Walloon Brabant. On January 1, 2006, Jodoigne had a total population of 12,440. The total area is 73.31 km² which gives a population density of 170 inhabitants per km². The present municipality includes the villages of Piétrain, Saint-Jean-Geest, Saint-Remy-Geest, Sainte-Marie-Geest, Zétrud-Lumay, Dongelberg, Mélin, Lathuy, Jodoigne-Souveraine and Jauchelette. The previous mayor of Jodoigne, Louis Michel, a liberal politician was the Belgian foreign minister from 1999 until 2004 and was the Belgian European commissioner from 2004 until 2009. The current mayor is Jean-Paul Wahl. The asteroid 1199 Geldonia was named in its honour (from the Latin form of the name) by Eugène Delporte. ^ As if it were spelled Jodogne; ʒɔdwaɲ is considered erroneous. This page was last edited on 22 July 2018, at 21:45 (UTC).